Who's ready for a giveaway?! I could not be more excited to introduce you to Buddha Brands Company and their line of delicious, rejuvenating, all around good for you drinks and snacks. 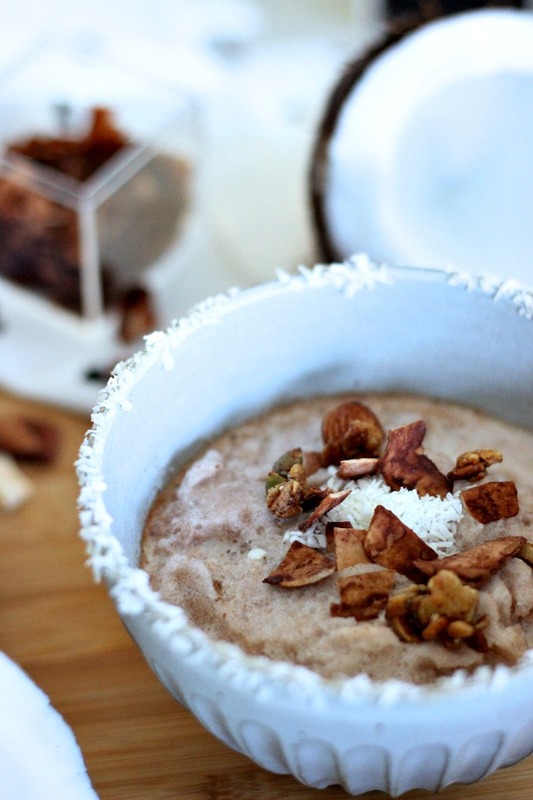 If you didn't already know, the healthy properties of coconuts are mind-blowing. They are known to improve heart health, help with digestion, increase metabolism, are antibacterial (fights off fungus & yeast) and are high in dietary fibre. It’s safe to say I’m obsessed with these little magical (ridiculously hard to open— yes, I bought a whole one) fruits, or nuts, or seeds (whatever they are), in every form (oil, milk, water, flakes, etc.). Buddha Brands Company has taken one of the ultimate super foods and developed healthy, deliciously addictive and innovate snacks and beverages to balance your body from within. They promote a lifestyle that focuses on healthy and happy living and seeking balance, which I am all for! 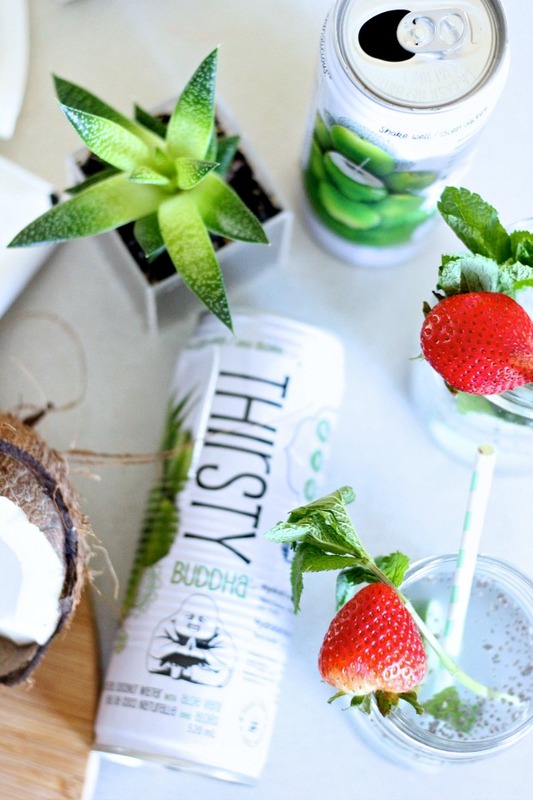 In addition to original coconut water, Buddha Brands Co. has developed new Thirsty Buddha Coconut Water With Aloe Vera to help you glow from the inside out. The water contains aloe vera, which has rejuvenating, healing and soothing properties, so this water is really the ultimate beauty/wellness beverage. The subtly sweet, crisp and refreshing taste is great on it’s own and in smoothies, or made into cocktails (hi there, healthy cocktails! 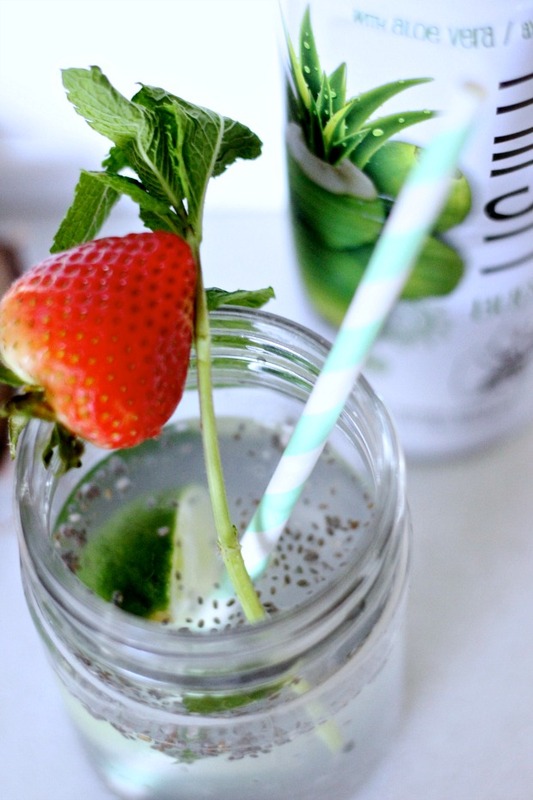 ), or my flavoured chia seed fresca (see below). Buddha Brands Co. also offers a line of Hungry Buddha coconut chip snacks that I am equally obsessed with. The four flavours are Classic Coconut, Smokin' Sriracha, Cheeky Chocolate, and Wild Wasabi. They are the perfect on the go snack for whatever flavour you are feeling, or can be added in to dishes or as toppers to enhance your recipes. Think smoothies, salads, avo toast... the possibilities are endless! I took the products and added them to a few different recipes to get you thinking of exciting new ways to experience Buddha Brands Co. 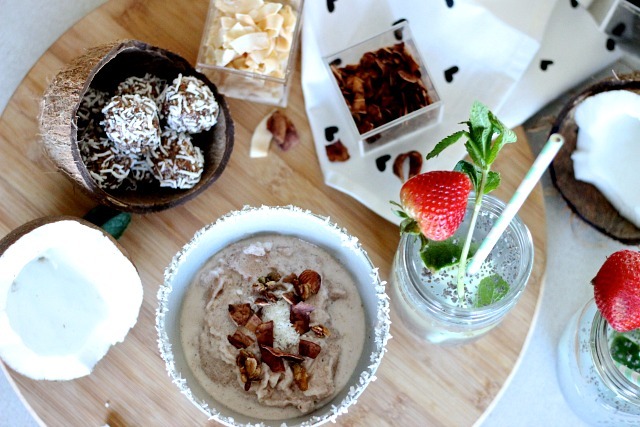 I added the chips to my coconut almond balls, created a refreshing chocolatey (high in protein) smoothie with the original coconut water, and created an Aloe-Mint-Lime Chia Fresca. Make all three and let me know your favourite! 1. Place the almonds in a food processor and process until a powder like texture forms. 2. Add the agave nectar, cinnamon, coconut oil and coconut chips and process until combined. 3. Place the coconut flakes in a bowl. 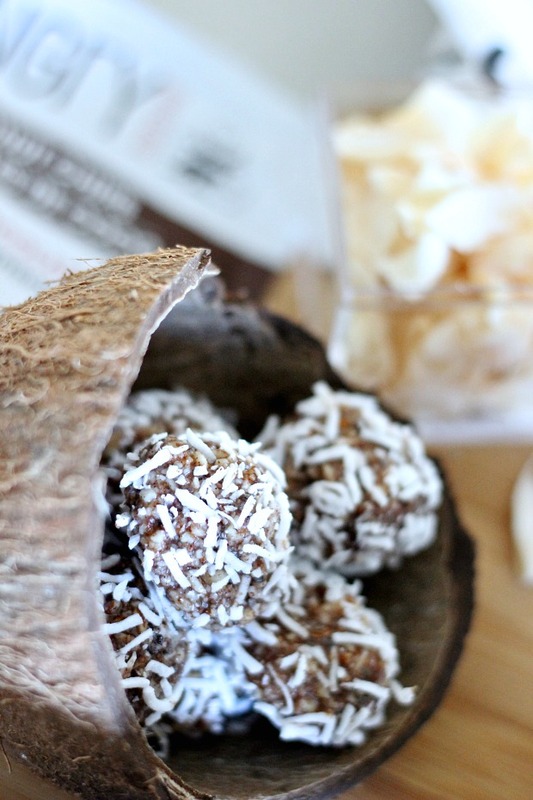 Using your hands roll the dough mixture into balls and roll balls into coconut flakes to coat. Set in fridge, and keep balls in fridge to keep fresh. 1. Place 1 tbsp of chia seeds into glass. 2. Fill glass with Thirsty Buddha Coconut Water with Aloe and stir, making sure chia seeds have not clumped at the bottom. 3. Squeeze 1/2 a lime into the glass and top with a few mint sprigs. 4. Let chia seeds soak for 20 minutes. 1. Add all ingredients to blender and blend on high speed. 3. 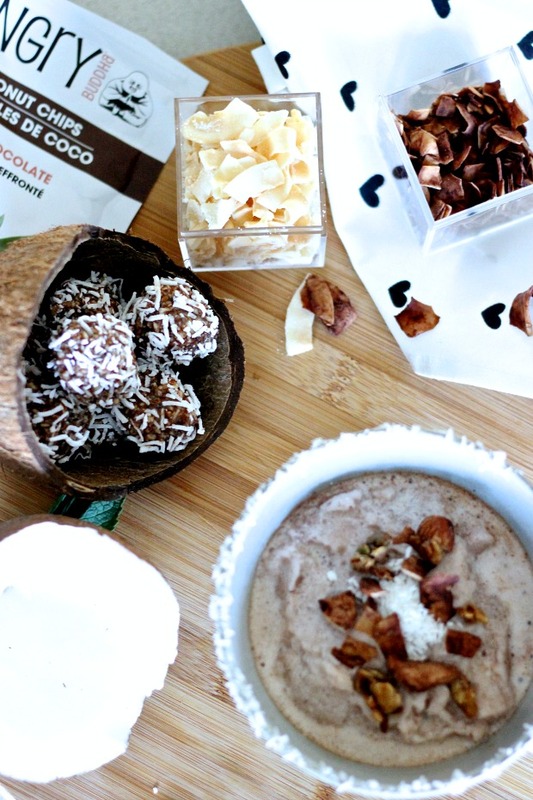 Top with Hungry Buddha Cheeky Chocolate Coconut Chips. Now that I have raved about Buddha Brands Co. I’m sure you are ready to get you hands on some of these goodies, right? Get ready to nourish, glow and rejuvenate! Did I mention also become addicted? In the best way possible! I am SO excited to partner with Buddha Brands Co. to offer you the ultimate giveaway—a month supply of coconut water, including the new flavor, and coconut chips! Be sure to enter below to win this amazing prize pack. Contest open to Canadian residents only. Contest closes at 12:00 AM on 04/25/2016. DYING to try the Smokin' Sriracha Coconut chips... the bf will love these... hope he leaves me some! The Chocolate Smoothie with Thirsty Buddha Natural Coconut Water! delish recipes! I will make the raw chocolate balls! thx 4 the contest! I love *love* Hungry Buddha coconut chips and I bet they'd be delicious in the coconut almond balls. Thanks for the recipe! 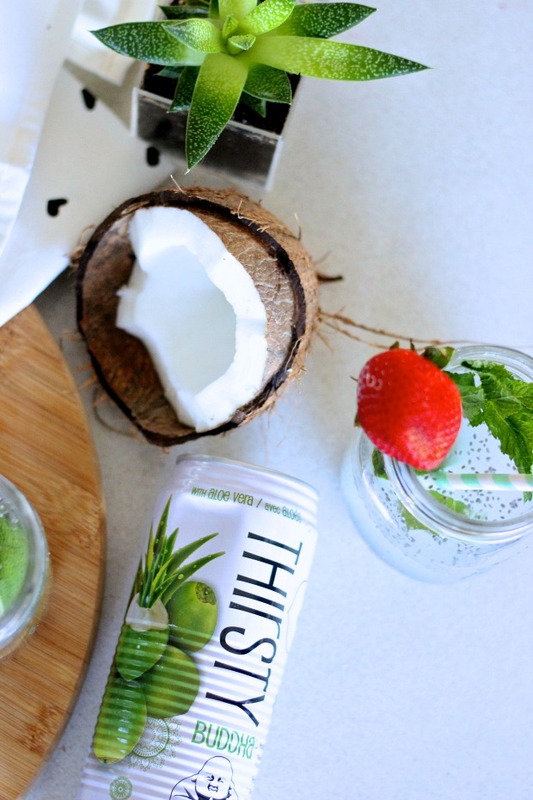 I am excited to try new Thirsty Buddha Coconut Water With Aloe Vera !! I'm most excited to try the Hungry Buddha coconut chip snacks in the Classic Coconut flavour!